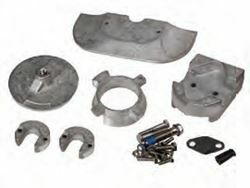 Sacrificial anodes counteract galvanic corrosion by adding a third metal into the circuit, one that is quicker than the other two to give up its electrons! 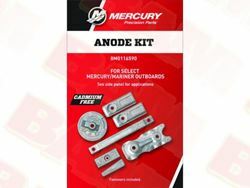 protect your Mercury Outboard, Mercruiser sterndrive, gearcase, lower unit, trim tabs, power trim, anything Mercruiser or Mercury with anodes or MerCathodes. Aluminum andoes are for use in saltwater or freshwater. Magnesium anodes are for fresh water only. Zinc is not recommended for fresh water. Protect your investment!